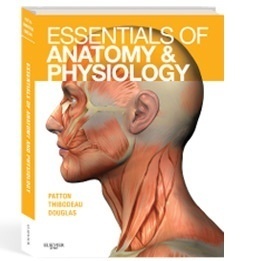 Want to know more about the anatomy and physiology textbooks that our team has produced for use in your A&P courses? Check out the entries below, then take a look at the advice at Textbook Choices to see how to determine of any of these are a “best fit” for your course. Chunked into short chapters and sections within chapters for better student learning and reading comprehension. Heavily illustrated with an attractive art program, colorful micrographs, pathology photos and medical images, all in consistent styles and color coding. Comprehensive chapter word lists that provide pronunciation guides (including online audio pronunciations), plus dissection and translation of word parts to promote easy familiarity with scientific terminology. 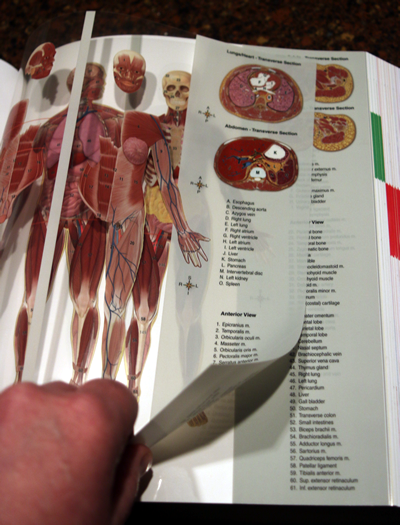 Unique”virtual dissection” overlay system inserted into each book gives students a layer-by-layer, 3-dimensional perspective on structural relationships within the human body. The Clear View of the Human Body includes both the classic anterior view and the informative posterior view of organ relationships. A modern version of an anatomy classic! Chapter questions at multiple levels of Bloom’s taxonomy. Free online resources, including expanded articles on interesting subjects and integrative topics. ESL/ELL friendly, including a comprehensive glossary with pronunciation guides. Published and supported by Elsevier Publishing, a world leader in medical, nursing, and health publishing. 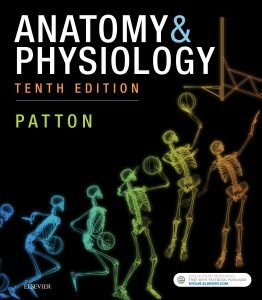 For the comprehensive two-semester A&P sequence, this readable text in a conversational style features the most up-to-date content of any A&P textbook. This textbook also includes many embedded study tools and instructional design elements based on the best evidence of learning science. Learn more at the publisher’s product page. Request a free examination copy. Browse Kevin’s blog that explains the features—and includes notes from the author. For the comprehensive one-semester A&P sequence or a two-semester sequence that emphasizes core concepts. This easily readable text features also includes many embedded study tools and instructional design elements based on the best evidence of learning science. Think of it as a more focused or “light” version of the bigger Anatomy & Physiology text. A classic textbook of the basics of human anatomy and physiology that is ideal for a one-semester introductory course for many of the health careers. Containing updated concepts and learning strategies, this book focuses on the essential ideas and facts that a beginning student needs for a solid start in learning a health career. It includes many clinical examples and disease concepts, but for broader coverage of pathophysiology, check out The Human Body in Health & Disease. An extended version of Structure & Function of the Body that also includes concepts of pathophysiology integrated with basic anatomy and physiology. Unlike some others, which seem to drop individual disease coverage in here and there, this textbook takes great care in presenting the patterns of disease mechanisms that help students understand the individual disorders more clearly and more deeply. The expanded illustration program includes many pathology photos that bring the text narrative to life. I guess you could call this page self-serving because I seem to be promoting products for which I get paid. Yep, that’s what I’m doing. But my primary purpose in writing textbooks and telling you about them here is not to make money—although that sure helps me pay the bills and feed my family. My primary purpose is to help teachers teach and to help learners learn—and if my books are a good fit for you, I want you to get to know them. If they don’t fit, then please try one of the other fine A&P textbooks out there. By the way, I also make money from teaching—perhaps just like you do—and I’m not shy about promoting my courses, my program, and my colleges, either! Check out these additional tools!